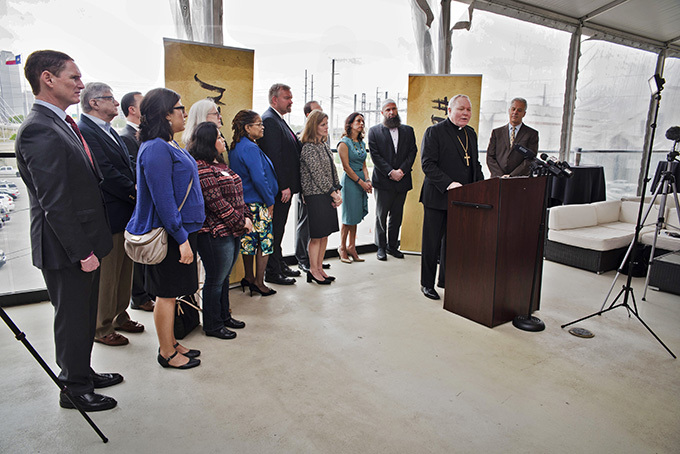 Bishop Edward J. Burns encourages North Texans to take to heart and practice the “Golden Rule” in their treatment of all people during the April 6 announcement of the #BeGolden campaign. Bishop Edward J. Burns cited the words of Scripture, Pope Francis and the Statue of Liberty’s inscription in unveiling an initiative on April 6 that encourages North Texans to take to heart and practice the “Golden Rule” in their treatment of all people. The year-long campaign — #BeGolden — will reach across all faiths in urging compassion for all, with an initial focus on immigrants and the chief goal of fostering empathy and the recognition that immigration is a human issue. Bishop Burns announced that the Dallas skyline’s lights will turn gold on the evening of April 9 in conjunction with the initiative’s launch and to amplify the Golden Rule’s “Do unto others” message of treating others as one wishes to be treated (Matt. 7:12). The initiative was spearheaded by the Diocese of Dallas and joined by North Texas faith, civic and community leaders, 14 of whom attended Bishop Burns’ announcement and are among a growing list of #BeGolden ambassadors. He cited Joseph’s flight with the Blessed Mother and Jesus from Bethlehem to escape King Herod and Matthew 25. And the message of welcoming the stranger. The rights to life, food, clothing and shelter are not the province of the privileged alone but belong to the entire human family, Bishop Burns said. But he said that another important principle is that a country has the right to secure its border. “As Americans, we should cherish and celebrate immigrants and their cultures,” the bishop said. “People migrate because they are desperate…In an ideal world, there would be no need for immigration control. To demonstrate his support for the initiative, Dallas Mayor Mike Rawlings was scheduled to join Bishop Burns to announce #BeGolden at the kickoff of The Festival of Ideas on April 7 at the J. Erik Jonsson Central Library. Dave Woodyard, the president and CEO of Catholic Charities Dallas, said that a task force formed by Bishop Burns last year spurred the #BeGolden initiative. He said that objectives are bringing people together and making a difference in the community. Dallas County Judge Clay Jenkins told the gathering that Bishop Burns, Woodyard and the Diocese of Dallas profoundly influence the region beyond just the Catholic community. “It is the diocese; it is Catholic Charities and the person who stands in the role of their leader — Bishop Burns — who is stepping up in a huge way for our community to protect those people who are being marginalized for political gain and other reasons,” Jenkins said. The campaign will offer videos at begoldenjourney.com and provide events and exhibits to encourage North Texans to get involved.